the whole scene outside the lantern and then just lower it in. Much easier! The jingle bell garland around the top is merrily musical! I wanted to contrast the two neighbors. 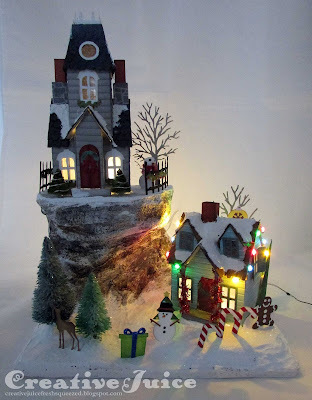 The house on the hill is a bit on the 'frilly' side while the person living down below is a bit 'funky' with their over the top Christmas decorating. I think it's quite fun all together! by a neighbor's house down the street. Their yard is stuffed full! Whew! You made it through the first half of the post. Be sure to head on over to the Frilly & Funkie blog to check out the challenge and all the fab projects their design team made. Enter and you'll have a chance to win a $25 spending spree at the Funkie Junkie Boutique! All right, here we go with some tutorial action! 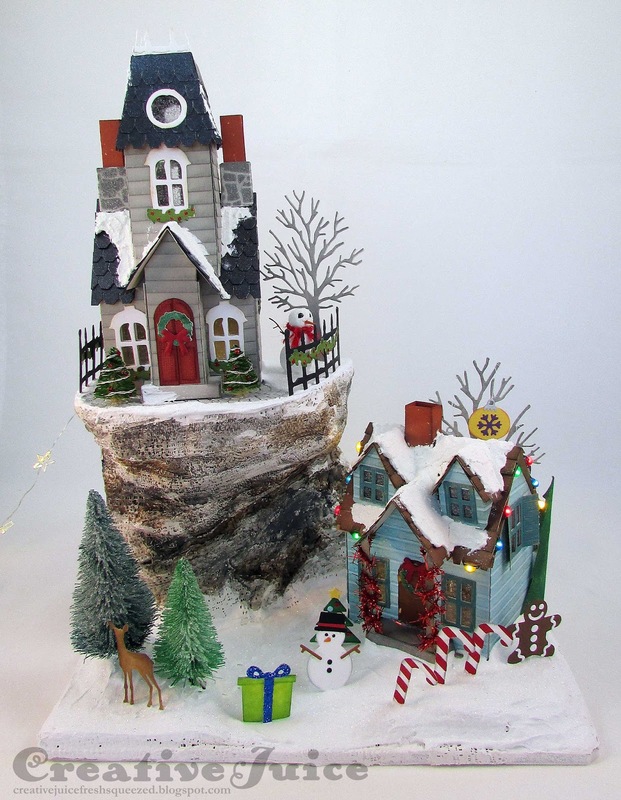 There are lots of videos on how to put together the houses, Tim Holtz has several on his blog. I'm mainly going to cover the base construction and lighting. See the tutorial on my Halloween Village blog post for more info as well. I like to construct the bases out of foam core board (found at office/craft stores). 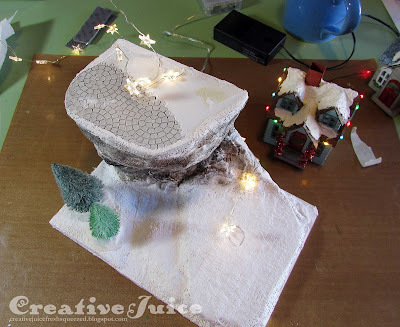 I built up the terrain and filled in the supports with wadded paper and tape. 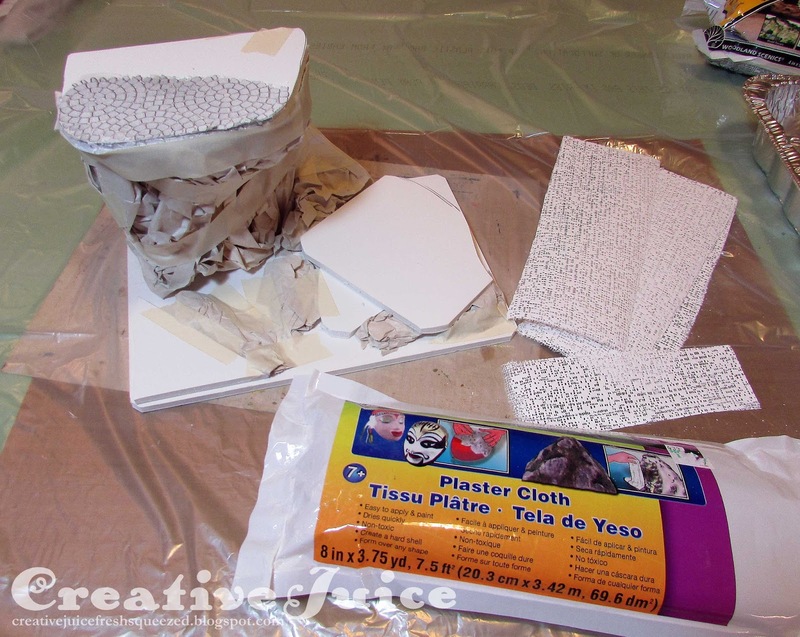 Plaster cloth strips are easy to use and form nicely over the base. oops, I forgot to take a photo after I did the plaster. 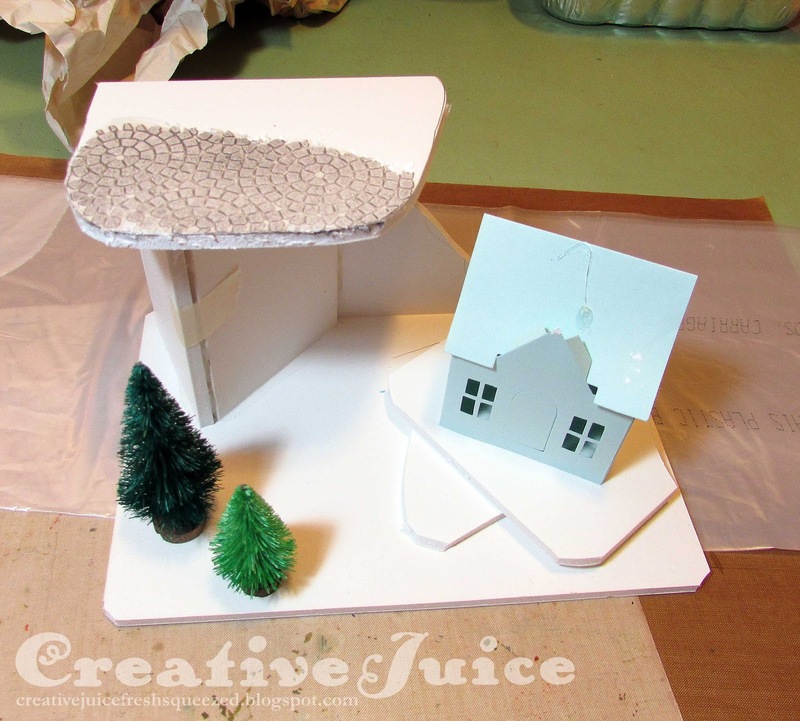 The roof lighting on the blue house was a bit tricky! Thanks goodness for fake snow; it covered up all the yucky wires and glue. I tacked all the wires in place with hot glue. 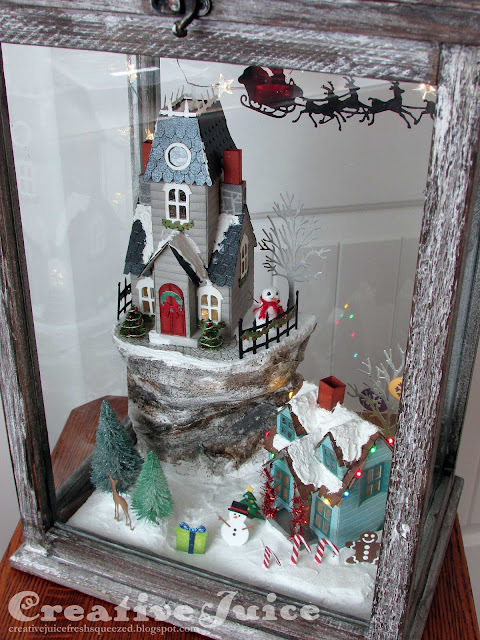 I used a palette knife to spread on the snow texture paste and then sprinkled it with Rock Candy Dry Glitter while it was wet. 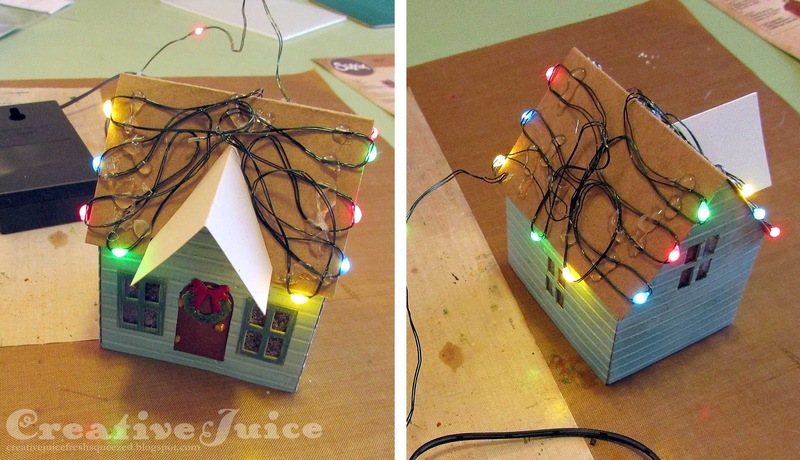 I used part of a garland of star LED lights I found at JoAnn's to light the houses themselves. 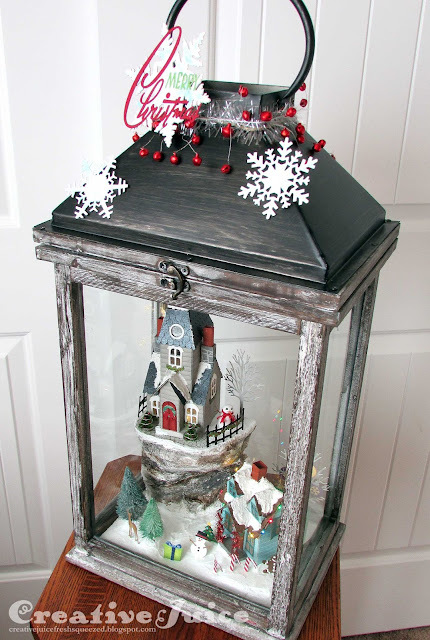 I glued down a couple of bulbs where they would be underneath the houses and left the rest loose to position in the 'sky' once the base was inserted into the lantern. 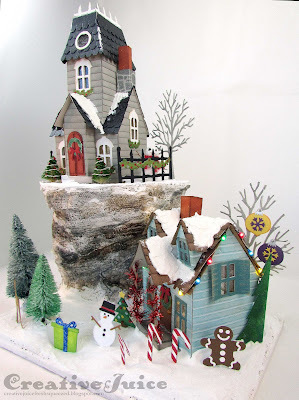 I then hot glued the houses in place and prepared my 'snow mixture goop'. I adapted a recipe I found on a model railroad landscaping tutorial to use media that I already had at hand (imagine that!) I used equal parts Prima Art Basics Light Paste, Prima Art Basics Gloss Gel, and Liquitex heavy body Titanium White acrylic paint. I added a tiny drop of Cerulean Blue paint. 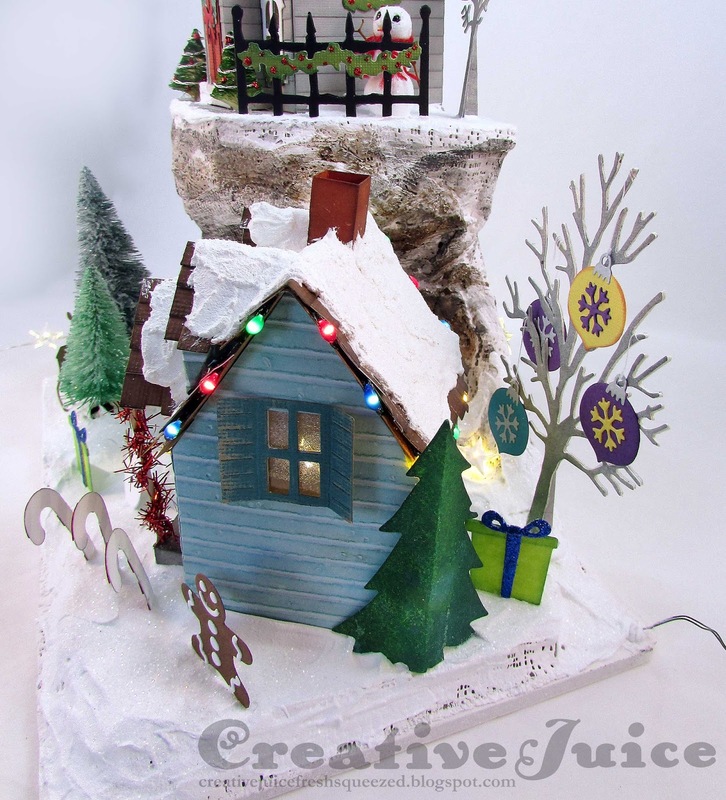 Once I spread it over the base I sprinkled it with the Rock Candy glitter. 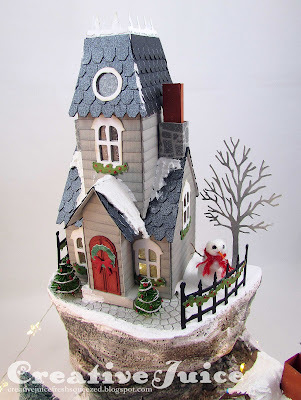 I had all my little decorations ready to go so I could stick them in the wet snow to glue them in place. The battery boxes/switches for the light strands I fastened into the lantern lid with heavy duty hook and loop tape. You need to be able to swap the batteries in them! Thanks for stopping by and checking out this really long post! I hope you are inspired. =) Merry Christmas to you all! This project is totally amazing!!!! WOW says it all. It is such a pleasure looking at the incredible detail. Thank you so much for sharing it. Oh, my word, Lisa! What a delightful Christmas scene filled with so many brilliant details! I love how you worked around the light situation--so clever! And I was so tickled to see Santa and his reindeer--I was a little worried over at F&F when I didn't see him! 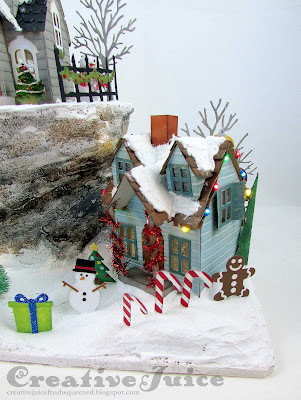 Seeing all the details, like the wreath and garland, the brick walk and the snowman on the frilly house just makes me want to live in a house just like that! The funkie house all decked out made me giggle, because we all know those people had fun decorating right down to the tinsel garland on the front porch! Oh, how I love that it lights up! You are clever, girl, and have such a wonderful imagination and the ability to bring it to life! 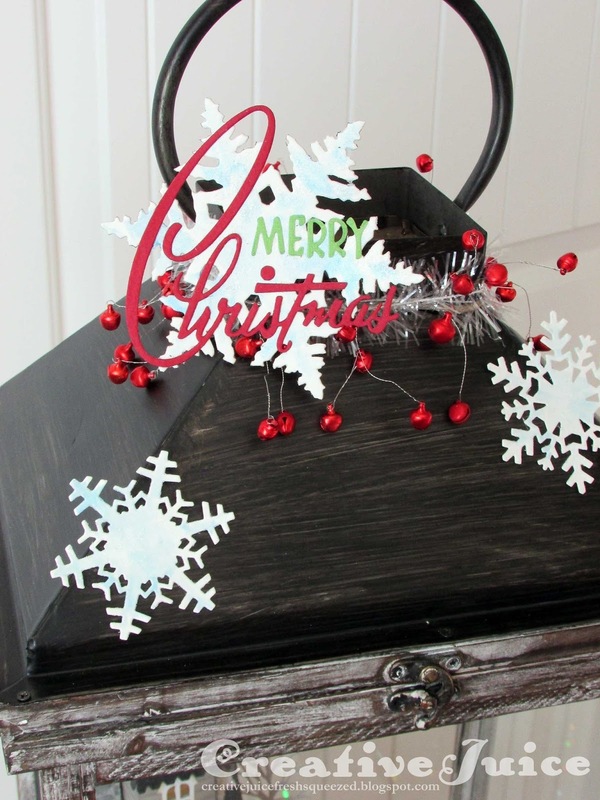 Sending big hugs and wishing you and your family a Merry Christmas!